Today I am very proud to present our ninth guest blogger Marc A Pitman. Marc is a fundraising trainer, and the author of Ask Without Fear! and founder of FundraisingCoach.com, a website dedicated to practical ideas for fundraising more effectively. There are only two ways to make a change— whether changing nations or changing your neighborhood. 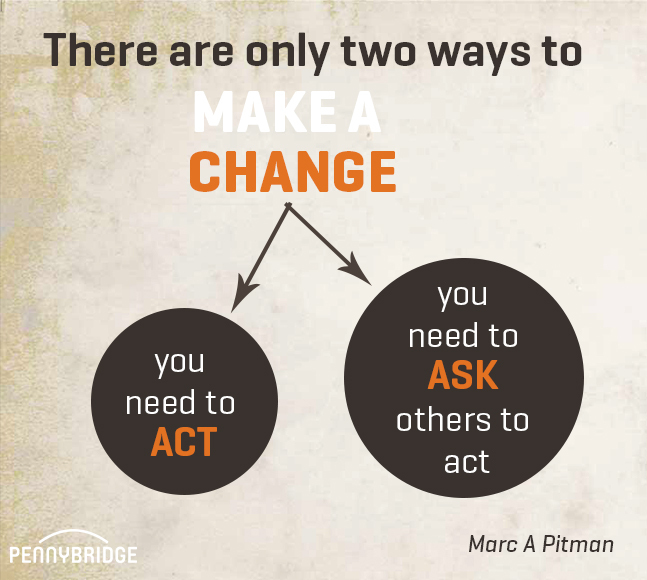 You need to act and you need to ask others to act. Ask and act. Each of us has the ability to choose how we respond to situations. We can choose to buy from a locally owned store or from a global chain. We can choose to put down our phone and talk to the kids in our community. We can choose to give donations of time or money to charity or invest them elsewhere. The interesting thing about actions, even small ones, is that they become habits. Even emotions. Those habits can propel us forward or hold us back. The choice is up to us. But our actions alone rarely bring about as large as a change as we would like. So we need to ask others. Ask others to give money to the cause. Ask others to lend their expertise. Ask others to volunteer. Learning to ask effectively is one of the most important skills we can learn in life. As we learn to ask well, we’ll learn two things. Some people will say “yes”! Think back to the last time you asked someone to take action and they said “yes.” It’s an amazingly good feeling, isn’t it? When doing fundraising training, I often ask people if they’ve made an ask and had the donor get so excited their eyes lit up with joy and excitement. Usually some of the people in the room have. These “yes” responses almost become addicting. They give you the motivation to ask without fear. Who knows? Maybe the next ask will be a “yes”! Both rely on you As you look over the coming week, look for ways that you are acting and ways you are asking. The good news and the bad news is that both rely on you, your effort. It’s good news because you’re in control. It’s bad news because if you don’t act and ask nothing will change. It’s up to you. How are you going to act this week? And who are you going to ask?